This morning I noticed a small gathering of cats on our stairs. They were staring intently at what I thought must be a small mouse that foolishly found it’s way into our cat-infested home. Normally, I would come and rescue the hapless creature (by taking it outside far, far away. ) but something held me back this morning. I kept getting little glimpses of a long black tail, yet not one out our curious cats lifted a paw towards the creature. Instead, they seems to be scratching their heads wondering what on earth was going on. I came closer to investigate only to be greeted by a slimy black…thing…with a feather stuck to it. When Shaun blearily stumbled into his computer room, he was greeted by a small container with the creature inside of it. He merely grunted and vaguely wondered where the salamander had come from. He barely blinked when I launched into the story about how the cats had found him and we couldn’t figure out how he had gotten into the house and…when I paused for breath, Shaun took the opportunity to ask me to find a new home for it. Deflated, I took the poor feller outside to release. First, I had to take a picture of him. I couldn’t help but wonder what the chances of survival for this little guy could be. I tried nudging him out of the container, but he remained curled up in a corner and barely moved. Finally, I ended up dumping him gently out in the grass. Once he felt the earth under his belly, the poor dying critter had an instant recovery and zipped off under the porch. I had to laugh at how well he had deceived us! We’ll probably never know how that little amphibian found his way into our house. Not only are we not near any water, our cats stay indoors and the dogs could care less. It will probably always remain a mystery. This entry was posted in Critters, NaBloPoMo, Random stuff and tagged animal rescue, cats, newt, salamander. Bookmark the permalink. That’s a salamander???? I thought it was a squirrel embryo!! YUCK!!! When I was young, we had a similar experience at our house. However, instead of a salamander it was a Western Alligator lizard. And, for some BIZARRE reason, we decided to keep it as a pet. What we didn’t know what that they just grow and grow and grow. So, when it was only a few inches long when we found it, it was a few feet long when we finally let it go. We named her Rosie–for all I know she’s still living under the fishpond at my childhood home! Wow, Hilary. Way to scare a person! I’m sure it didn’t have time to lay eggs. I’m so glad your cats didn’t do away with it. He reminds me of the illustration of Gollum on the cover of the edition of Lord of the Rings I had in the 1960s. Wow! You do have critters! 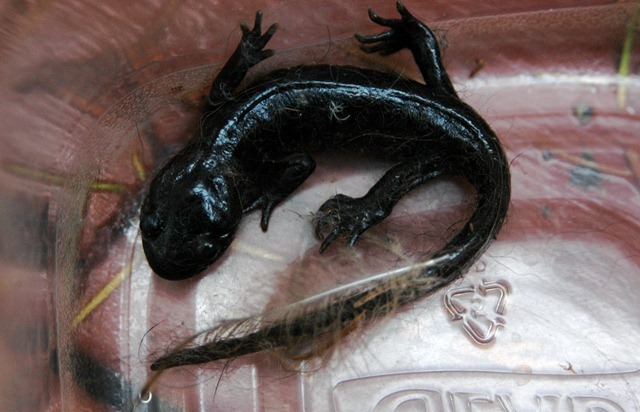 It’s sure nice to know that a critter was saved, and I’m glad your cats or dogs didn’t get a hold of it.